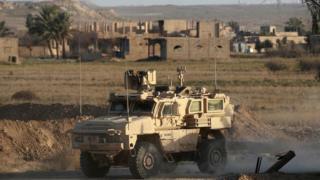 The US-backed Syrian Democratic Forces (SDF) have launched another assault on the Islamic State group's last enclave in Syria. Head of the SDF media office, Mustafa Bali, tweeted their troops were in "direct violent clashes". Islamic State militants are centred in the town of Baghuz in eastern Syria. Once the village is taken, the US and its allies are expected to formally declare the end of the "caliphate" proclaimed by IS in 2014. What's happening in eastern Syria? After five years of fierce battles, local forces backed by world powers have driven IS out of all but a few hundred square metres near Syria's border with Iraq. Sunday's attack began at about 18:00 local time (16:00 GMT), with air strikes aimed at weapons stores. SDF and coalition planes are involved in the assault, and the militant camp is now ablaze. But the SDF has said before that it had launched a "final assault". After intense air and artillery strikes on 1 March, the alliance said it had to slow down the offensive "due to a small number of civilians held as human shields". About 3,000 people were evacuated on Monday and another 3,500, including 500 militants who surrendered, followed on Tuesday. Mr Bali told Reuters news agency no further civilians had come out of the town since Saturday. He also said more than 4,000 militants have surrendered in the past month. Five SDF fighters who had been held hostage by IS were also freed. But Mr Bali tweeted that the fate of other hostages remained unknown, including those of Italian priest Paolo Dall'Oglio and Lebanese journalist Samir Kassab. What's left of the Islamic State group enclave is an easy target - a couple of tented encampments surrounded on all sides and under regular bombardment from coalition warplanes. But the Kurds have taken an incremental approach. Attacking Baghuz and then calling ceasefires to allow IS supporters, hostages and children to leave. Sunday saw dozens of lorries arrive to evacuate more, but only a handful of people left. This might be the final assault, or it might be another ploy to again force people to leave. The fighting won't be easy. The Islamic State group has riddled the area with homemade explosives and still has plentiful supplies of ammunition and weapons. Clearing the last enclave could take days, if not longer. It is thought that the IS leadership has already fled. Despite losing nearly all the territory it once held across Iraq and Syria, experts still believe the group constitutes a major threat. US National Security Adviser John Bolton said in an interview on Sunday the group had fighters "scattered still around Syria and Iraq and that [IS] itself is growing in other parts of the world". US President Donald Trump has previously said Islamic State was defeated, but Mr Bolton clarified the president's statements. "He has never said that the elimination of the territorial caliphate means the end of IS in total," he said. "We know that's not the case." The Worldwide Threat Assessment report, presented to the Senate in January, also highlighted the continuing dangers of the group. While IS will probably not immediately aim to take new territory, the report assesses its militants will try to "exploit Sunni grievances, societal instability and stretched security forces to regain territory in Iraq and Syria in the long term".